Oren is Faithkeeper of the Turtle Clan, Onondaga Council of Chiefs, Haudenosaunee (Six Nations Iroquois Confederacy). He has been active in international Indigenous rights and sovereignty issues for over four decades at the United Nations and other international forums. He is a State University of New York (SUNY) distinguished services[+] professor emeritus of the University at Buffalo. He serves on the board of Bioneers an environmental champion of the Earth. Oren is chairman of the board of directors of Plantagon International AB, the leader in urban agriculture, Plantagon is designed to meet challenges of compounding human population, finite resources and global warming. US History - How Can You Buy Land? Just state your name and your clan name. I’m Oren Lyons, that’s my English name. [Jo ah grish mo] is my clan name. The wolf is my clan. Onondaga is my Nation. The Haudenosaunee (ho dee noe sho nee) is the Confederacy. And the Confederacy is better known as the Iroquois. We’re old people; been here a long time. The first question, from your vantage point, from your Peoples’ vantage point: What is creation? That’s huge, it’s huge, like creation. Creation is the universe. Creation is everything that we can see and probably a whole lot that we can’t, probably more that we can’t see. But it’s what’s about us and it’s the relationship, this amazing web of Life that we have here. And Nature, which is part of Creation, is more like the Earth itself in its part, in its position, in this whole web of Life in the creation. We have relationships with all the elements and forces of Life including the Sun, we call our Elder Brother, the Moon we call, our Grandmother, the Winds we call our Grandfathers, the Four Directions, our Grandfathers. And then all of the elements of Life itself. So in this idea of creation, Nature is the Earth itself and we call the Earth, Mother, ETENOHAH, our Mother. As we call all women ETENOHAH, mothers. And from mothers spring Life and we understand that. And we know that Life springs from the Earth, that generations that are looking up, layer upon layer, waiting their time to come up and serve and be, is our responsibility. So the Earth is female. The Earth is the Mother so how are humans described? If you have a mother then you have children. So we’re children. We’re children of the Earth. And we’re tied to the Earth. We come from the Earth and we go back to the Earth. And the Earth has great systems of regeneration. Great cycles of regenerative Life. And it’s these cycles that we’re all part of. Just as the Earth has seasons of Life, all animals and all things that grow and fly including humans have seasons of life as well. So we grow in the same style. What’s different about all of that is the time. The time that’s allocated to the varieties of Life that are on the Earth. And we have a fairly long system of life but not the longest. Turtles live beyond us. Parrots live beyond us. There are certain mammals that have an older life cycle than we do. But we have a long life cycle as it is on Earth. Then, also, when you move down to the fine insects their life cycle is counted in days. What you have is this variety and complexity of life and the times that are allocated and what happens during those times for each of these elements. That’s what’s important to understand. In the understanding of the Earth, what are your recommendations for how we should treat—how humans treat the world and the planet and our resources? What is the disposition that we need to take, humans, towards the gifts that the planet provides us? What I’ve noticed and know about Indigenous People around the Earth is that many, many Indigenous Nations have been able to hang on to the knowledge that they have, a traditional knowledge. Fortunately I think for everybody. In this traditional knowledge are the directions, are the instructions, for a good life. We have instructions about how do we conduct ourselves on this Earth. Probably the first one is respect. I think if there was a law, common law, around the world Indigenous Peoples and I think everybody, respect is a law. If people followed this law, simple law of respect, we’d have a lot more peace and you’d have a lot more quiet and a better life. I’d say respect, conduct yourself accordingly, and recognize what your obligations are and what your duties are. The duties are to protect these life forms. 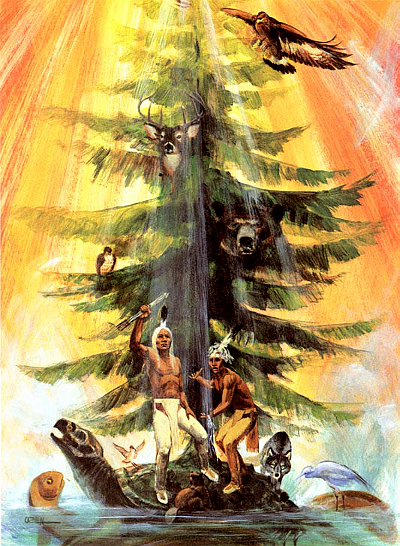 When the Peacemaker came to our territory about a thousand years ago and brought this whole concept of peace as the original Five Nations—the Mohawks the Oneidas, the Onondagas, the Cayugas, the Senecas—we were in a constant warfare and we had really forgotten our instructions that we had prior to that and were not living by them. The Peacemaker came among us and brought this whole idea, concept of peace and democracy. He gave it to us whole and it took him a long time to do that. There’s a whole story about how he came and how he worked with Hiyanwenta, whom you call Hiawatha, and how they worked and brought together this great Confederacy called Hau dee no sau nee based on peace, based on equity and justice for people and based on the power of the good minds, the power of unity, the issues of health. All given to us a thousand years ago. He laid out the process by which we do this. One of the first things he said was he was going to give great responsibility to the women since the Earth is female and the women should be working with the Earth. Men would be in charge of fire. Women would be in charge of water. So the men, our work is to see to the welfare; we do counciling, we do meetings, we do all of that. And if needs be we fight. But basically we’re dedicated to peace. And that was what’s so important about that time, a thousand years ago. When, if you looked in Europe at that time, as great wars were going on and the whole history of Europe as I saw it is one war after the other, century after century, how people lived in constant fear and thousands of thousands of people died. Well, in this part of the universe, which was just isolated, the western hemisphere wasn’t even known about. We were operating under a different system. It was basically one of respect and councils of leaders to try to keep the peace because human nature is human nature. You have to have a process by which to meet problems. You have to have rules and so forth. So the rules were always based around respect. Fundamental to all of that was the understanding of how the Earth itself was paramount to all of our life. So in this idea of respect was also the understanding of what we should do and how we should conduct ourselves according to the elements of the Earth and all of the natural world. We always said that we have been told and understand that we’re relatives. Where our white brother will talk about water and trees and animals and fish as resources we talk about them as relatives. That’s a whole different perspective. If you think that they’re relatives and you understand that then you’re going to treat them differently. The responsibility, the Peacemaker said to us, was very clear. He planted a great tree of peace, a great white pine, a great symbol to our Nations. He said, This is the Great Tree of Peace. He said, Its roots will be four white roots of truth and reach in the four directions of the Earth. And those that have no nowhere to go can follow the root back to its source and come under the protection of the Great Tree. And he says, On top of this tree I place the Eagle; the Eagle who will watch everything and guard the security of this tree and will let us know when problems are coming. He said that this Tree of Peace is a spiritual law and represents a spiritual law and the spiritual law is the law of Nature. He told us explicitly, Never challenge this law because you cannot prevail. You will not prevail; wrap your laws, your rules, and your conduct. He said, You, the leaders, when you’re weak as a human being, he said, this tree will give your spine strength. Wrap yourself around this tree because it’s powerful. Do not challenge the laws of Nature because you cannot, you will not, prevail. Now that’s great wisdom. That’s a thousand years ago and it reminded us of our obligations. Indian Nations in North America, South America, Central America, as far as I know, Indigenous People around the world, all have ceremonies. And these ceremonies are thanksgivings for what we have. We have just now initiated a great ceremony for the trees at Onondaga, Long Houses of the Six Nations, still operational. We hold these ceremonies for the Leader of the Trees which is the Maple. The Maple is the Leader. So we have a ceremony of Thanksgiving as soon as the sap starts running. When the sap stops then we’ll have a closure ceremony. But in between, we’re thankful for all trees of this Earth, wherever they are, whatever their names are, those that we know and those that we don’t. We give thanks. If this kind of instruction were given and understood by other people, you wouldn’t be cutting trees all over the world and destroying the infrastructure of Life and everything that’s in the woods. We had a profound agreement when we first initiated the Five Nations, later become the Six Nations with the Tuscarora Nation, came in 1713, 1722, became the Six Nations. But we all agreed. We all agreed that we would work together and be together. We had a treaty, amongst ourselves, and it was called simply, One Dish One Spoon as a concept of sharing. This world has to understand the importance of sharing. I know that in the structure of the United States it’s very contrary to that as people are not instructed to share. They’re instructed to gain. They’re instructed to hold to themselves. They’re instructed to gather unto themselves. And they’re rewarded for that. So you have an instruction that’s contrary, very contrary, to this whole concept, if indeed this is what you think is right. But this, I’m simply telling you what our instructions are. Operating under this, I’ve traveled to Indian Nations across North America and Central America. I’m invited to the ceremonies and I always know what’s going on. I may not understand the language and the dances may be different. But I know what is being said. It’s always the same: Thanksgiving to the Creation. Thanksgiving to the life-giving forces of the Earth. When Christians came here they made life hard for us. They brought a whole different thought and idea. And we’re still suffering from that. But we can get into that on a later time. In relation to all of this, and you’re talking about conduct, the conduct is quite simple: respect for Life and understanding that Life is our relatives and how goes it with them goes it with us. We’ve taken this to a high degree. I’m the Chief under the Chiefs and the Council of Chiefs at Onondaga and I sit on behalf of the Turtle Clan, even though I myself am a Wolf. I’ve been there since 1967. I have a lot of experience with different administrations, with different events in this country. I’ve watched a lot of changes. And I see that we’re not doing very well. That we seem to be moving farther and farther away from what would be good for our grandchildren and their children. I think that the instructions for people is be respectful for Life, appreciate what you have, share what you have and make up your own mind about things. It’s very difficult to deal with a whole nation that’s instructed to be greedy. How do you deal with that? To be mindful of yourself in your own doings and to secure everything for yourself and to become as they pointed out a few days ago, one of the billionaires of the world. They promote that and they say that’s great. They say this is what you should be striving for. But we look at it differently. That amount of wealth, in this time in Life on Earth, is a lot of influence and a handful of people with that amount of influence and that kind of a direction in life are not going to take you in the right direction. I mean they piecemeal stuff, and I can’t say that they’re bad people. We don’t say that at all. We just say that their instructions seem to be directed in the wrong way. It’s interesting to us, being an American Indian, and familiar with the processes of foundations and people trying to get money for this and that and poor Indians and so forth. First of all today in all of the United States we’re less than 1 percent of the population of the country. The support for Indian causes from the foundation world is point zero six percent. Not even one percent going to Indians. Why is that? It’s an interesting question. Why is it that they don’t want us to survive? That they don’t see it’s important and that maybe we’re more of a problem. The whole process of the United States history has been to assimilate us. And of course it’s a question of land. We’ve been fighting this whole issue of land, of land claims. In 1492 we owned all of North America, and owned it in the broad sense in that it was in our care-taking and no one owns the land and it always belongs to your children and your grandchildren. So we were protecting it, in their interest. Well a whole different thought came here. When they first said they wanted to buy land our leaders laughed and they said, How can you buy land? They said that’s like buying water or buying air. You can’t buy land. Land belongs to everybody. But certainly not. Today we can see, yes, they do buy land. You can fly over America, you can see all the squares, all this land is bought. But, the land that you bought, you don’t carry the responsibility to be close with the land. It’s a personal gathering. And so the consequence of that is it’s deteriorating. I don’t know what the answer is to all of this. Except that under the leadership of this country right now we’re going downhill fast. I think that this present administration, Mr. Bush, is acting in a criminal manner in not telling the children or protecting the children and grandchildren’s interests. He’s not protecting their interest and that’s really criminal. That’s going against our instruction entirely. He’s not protecting Life. He’s promoting the interest of business. And their interest is profit. So we’re in a problem and the consequence of which we look at. The present state of the world is very serious in terms of its health and how the health relates to us. I think we have to understand something here and that is that the Earth can deteriorate and ultimately lose its life-giving forces and it can change and become barren or it can change and become snow. It has its own its own direction. It has its own will and ability. And we are part of that. Right now I see two big areas of concern. Sometime back when Einstein was asked a question about what is the most powerful law of the universe, he said it was the law of compound. I pondered that. I said, compound, What does that actually mean? I really thought about it and have been thinking about it. I come to the conclusion that it’s like an explosion in reverse. It starts slow and ends fast. Where an explosion starts fast and and slow. Compound are in two areas that I see, One is a compound of the ice melting and the other is a compound of human population. Both are moving and accelerating. Both are under their own direction and it doesn’t seem like there’s a control factor here for either one. Certainly the ice melt is something beyond our control at the moment. Because what it takes, it takes the instruction of the Peacemaker to be of one mind. He said when you’re of one mind the power of the good mind can change anything. We have to somehow get to that point of unity of thought and direction and effort. If we can do that we certainly can mitigate what’s going on now when our concern is for the children and their grandchildren and their children. Peacemaker said that we’re responsible and that we should be always watching. I think what he’s saying and the instruction is correct and could happen. America is isolated from the world both in thought and conduct, size, oceans. In that isolation it’s heavily involved in what’s going on inside America. For instance, I’m part of that too. Because this weekend Syracuse University just won the Big East title. I’m an alumni of Syracuse so I enjoyed that. But this whole country is fixed on the idea of sports. It’s fixed on the idea of distractions and human titillation if you will or whatever it may be. And they’re not looking at the large pictures and they’ve become insulated against the realities of the world. Even our poor people, poor people in the US would be wealthy in any other part of the world. I mean poor people in America have television sets. That’s not the way it is in the rest of the world. We’re less than 5 percent of the population of the whole world and yet we’re using one-quarter of all the resources. I know Vice President Cheney said, Well if we’re creating one-quarter of the energy of the world then it’s just right for us to use one-quarter of the resources. That kind of thinking is very destructive. I think we have to adjust and be alert and aware. We have to get a message to the people and they have to understand the seriousness of this situation right now. 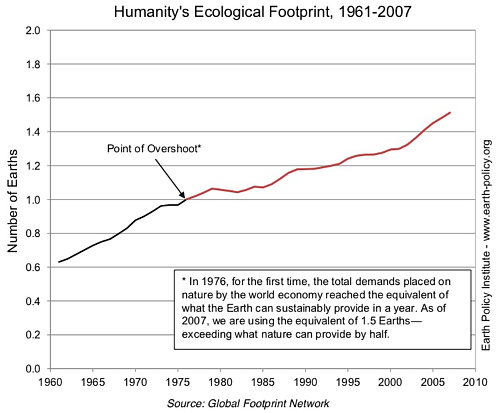 This compounding of human population. Lester Brown who has been recognized as one of the great scientists of the world concerning environment and interest said that in 1950 there was 2.5 billion people in the world. In 2000 there were 6 billion. In that short time we almost tripled the population of the world. That’s not sustainable. That is not sustainable. You can’t do that. But we are. And that’s a reality. Who knows that? Who thinks about that? 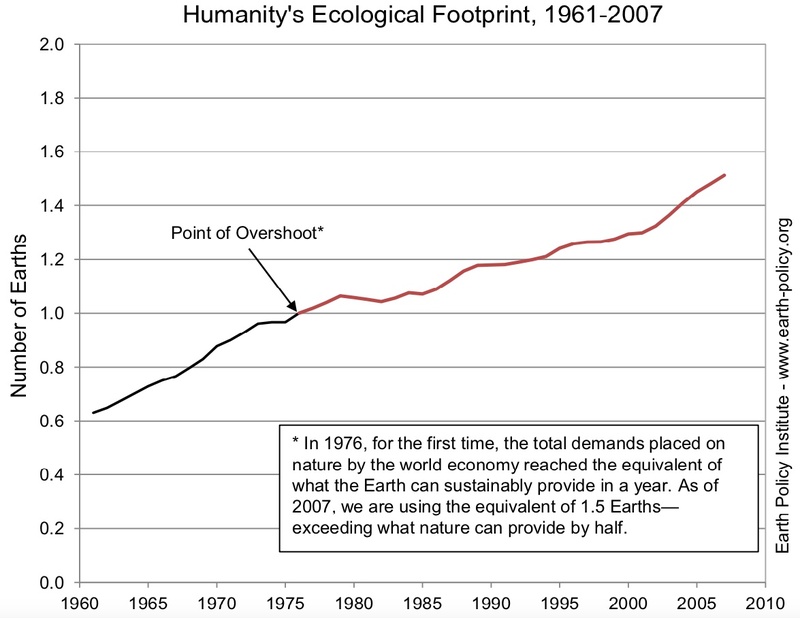 Point of Overshoot: In 1976, for the first time, the total demands placed on nature by the world economy reached the equivalent of what the Earth can sustainably provide in a year. As of 2007, we are using the equivalent of 1.5 Earth—exceeding what nature can provide by half. I heard Ted Turner say that one time. He said, In my lifetime I’ve seen this population double. You think about that. It took four million years to get to that point and takes something like 50 years to do it twice. No. That don’t work. So that’s what we’re facing in the world today. We have China who has 1.3 billion people, they’re probably more by this time. India which has 1 billion people. Just the two of them who are one-third of the population of the world. And they’re busy. We started out with that. You talked about destroying Nature. What have your Councils said about the state of the world? Has this been predicted? What were the signs and have the signs occurred? Have these signs, have things come to pass that you’ve been predicting? It’s interesting that Indian Nations have what they call prophecies. But also the Bible has prophecies and people have had prophecies all the time. Seems to be part of human nature. These prophecies currently we’re working on organizing them. As I studied them I come to the conclusion they’re not so much prophecies as they are instructions of conduct. Then a prophecy is being that, This will happen if you don’t do this. Or, This will happen if you drop this. It always leaves the option to the present. It always leaves the option to the current generation. I think that that’s the importance of these prophecies. We’ve had three three major events for the Haudenosaunee. One was the first time when we were given the instructions of how to live. Which some people would call religion or ceremonies. That was long ago. We’re not sure exactly when but we do know the process and we knew what happened, how it happened. That was very, very, very long ago. Then somehow we got lost, personally, I mean the Five Nations began this fighting. Then we had the second instruction or support, it was the coming of the Peacemaker, spiritual being, who gave us this great idea of democracy and organized our thoughts in that direction. I mentioned earlier that he gave this responsibility of raising the leaders to the women. He also instructed us on the importance of clans. I think this relationship is important. People should understand the relationship between us and the natural world. We love that so much that we have taken on the symbol of our relatives. As you see I’m wearing a symbol of the turtle. The turtle also represents North America, the great Turtle Island. And it’s a symbol of longevity and of strength. So we have a Turtle Clan and yet I told you I’m a Wolf. We have a relative of a wolf and the deer and the bear and the eel and the hawk and the beaver, snipe, all of these. The different Nations have different clans sometimes. I’m just astonished by the amount of clans that the Hopis have and the amount of clans that the Navahos have. They have a Wind Clan they have, just about whatever you could think of, there’s a clan. But it’s all related to Nature. So that’s how we see ourselves. And a wolf is a wolf is a wolf. I’m always mindful of what’s happening to my four-footed brother. And we were instructed to watch that and to see because they said whatever happens to him, it’s going to happen to you. So how we treat these animals who are doing what they do. They live in the state of grace. They don’t do anything wrong. They just do what they do and they do their best to do it in spite of everything and everything they continue. In New York City, as we sit here, pretty quick now there’s going to be hawks flying through here and certainly the geese are flying. This is an old flyway right here. They used to stop here all the time. They still fly, they still go by here because it’s an old rule, an old law. It goes on. It’s just that you don’t see them. But they are doing their best to continue. It’s like that around everywhere. We have to understand this relationship and so we have that and it brings us closer and it helps us to respect better how they serve with us and how Life works. Quite a while back, maybe 150 years ago, Chief Seattle said something that was very profound. He said a lot that was very profound. But one thing he said was, We are part of a web of Life and every strand is important and that what befalls one part will befall the other. This is what we don’t seem to understand or comprehend is this this web of Life that we live in and how interdependent we are. There was also an observation made, not very long ago, about the body weight of human beings some way, way, way back many years when the body weight was something like one-point-something of the weight of all mammals in the world. Today the body weight of human beings is 98 percent and all of the animals in the world are 2 percent. Think about that. Think what we’ve done already. There’s a great imbalance. There’s a great imbalance of humanity on this Earth and the natural laws don’t abide that. They don’t abide. And there’s law and the best thing you can do is keep the balance. So we should be paying real attention to that. Just the quality of life that comes from all the beings that are here, they’ll be denied our grandchildren. Then when they lose that and they lose even better perspective on how to survive. So we’re destroying their well-being. We’re really destroying the efforts that they can put forward if they have the respect and knowledge. This style of talking and observation, they tell me, it’s not realistic in today’s times. I suppose not if you’re thinking in terms of Wall Street and you’re thinking in terms of power and authority. But in the long run it is absolutely the law. As the Peacemaker told us, a long time ago, it will prevail. So the Earth itself, well, it’ll change. It’ll cool down. We’ll have another Ice Age and we’re in that process right now. The trigger has been pulled, the action is taken and it’s going on right now. I’ve had a lot of discussions with scientists in different parts of the world and they tell us that’s exactly what’s going on. The amazing thing is that this country, the United States, refuses to acknowledge that. Just astonishing. And time is an element now; now we’re bringing in another element, time. How much time? That’s always a question. There was a three part series written in The New Yorker, I don’t know whether you’re aware of it or saw it, last spring written by this woman [Elizabeth Kolbert]. Probably I think one of the best compilations of fact. Very realistic assessment on what’s going on. In that discussion, in her story, she told about how this present administration went to one of the scientists that knows about all of this, here in New York, and asked him what was his prognosis? He said, It’s bad. We’ll be lucky to be here in a hundred years and maybe sooner. He said also that people are going to have to adapt to the changes but the changes are going to come so fast that you won’t be able to adapt. It struck a chord because I remember at one point when the president was asked about this climate change, which is a softer discussion of global warming, he was asked about this, he said, Well we’re just going to have to adapt. Now I understood that he did know and he was instructed and he simply chose to use the words, We will have to adapt. Well of course we will, I mean there’s no other option and whether you’re capable. He didn’t go on any any further. His awareness then is obvious. Which makes his culpability more. The world needs good leaders and good leadership. I think what’s happening now is clearly an indication of where we are. It’s an international universal action now taken by these huge systemic changes. The Gulf Stream is slowing down in the Atlantic Ocean. It has been slowing down. 1960, the whole of the Atlantic Ocean was pure saltwater and now a convection of ice water, snow, and the melting of the snow and ice has mitigated the saltwater. We now have a convection of fresh water that’s reaching all the way to the Carolinas. 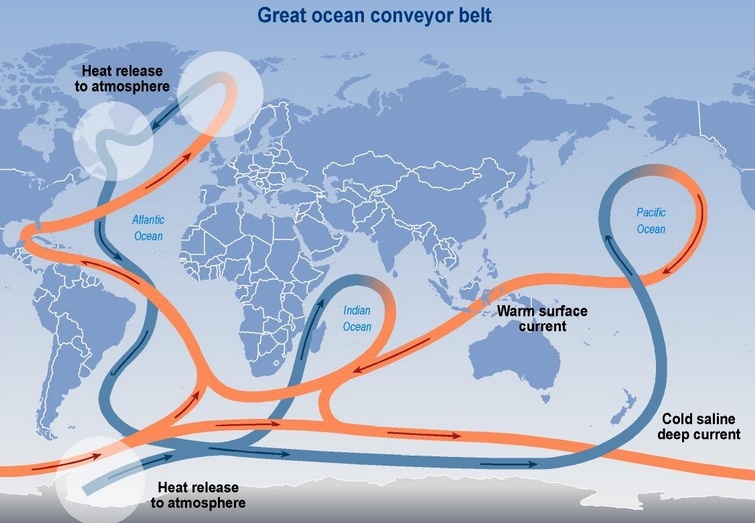 The result is that Gulf Stream is slowing down. In a report from the University of Bergen, a university that sits on the coastline of Norway, who monitors the current, gave a report in 2001. They said more or less, I don’t have the exact words, but more or less they said Gulf Stream slowing down and if it continues to slow down at the pace it’s going it could conceivably stop altogether within the next 15 years. So here we are now and that’s what’s changing. Now we’re hearing and seeing, in one report after another, the acceleration of the ice melt. That’s the condition of the Earth. That’s where we are. How do we meet that challenge? We have to take some instruction. I should give you some hope here in that other Nations of the world are very much aware of this and they’re trying hard. They look at the United States as completely crazy. They think that this country is just simply not in its right mind and they’re actually mistaken and looking at us as a whole. But I remember too that in 1992 when we went to the Rio meeting on the issues of environment, the great meeting that was held in Rio, and when President Bush number one spoke he said (and I guess I have to paraphrase again because I do remember it), he said the American standard of living for the United States is not up for discussion here. This is an amazing statement because everybody had come from around the world—I don’t know, I believe the biggest gathering of world leaders ever—to meet this problem and he laid it right out flat. Okay, that’s everybody’s problem but we’re not going to discuss that here. When you’re talking about one of the biggest instigators and the leader says that, that doesn’t leave you much hope. I think the American population have to really think about leadership now. Got to change leadership, you’ve got to get good leadership and leadership has to be responsive to the welfare of the people not to the welfare of interests. Those are simple things but they’re very difficult. I think a democratic process in America has been co-opted now by corporations and big money. It’s hard to even reach the ear of your representative for the common person. So the common person feels helpless. 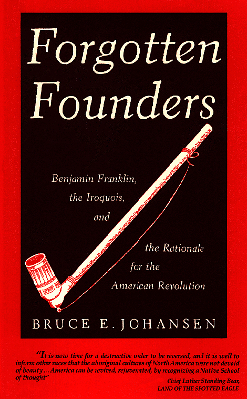 But they aren’t if they understand in this idea of democracy which I must say, the Iroquois had a lot to do with. Read the discussion by Ben Franklin, he will tell you that he was very, very impressed with this idea of democracy and leadership by agreement and consent and the ability to set up leaders and remove them. He was very, very impressed. From 1754 when they had a discussion in Albany, plan of Union came directly from Six Nations. He asked our leaders to preside. A chief by name of Hendrick, Mohawk Chief presided at that time, explained and talked about democracy. We’ve had a lot to do. We have in 1987 the Senate passed S.76 recognizing the contribution of the Iroquois to the Constitution of the United States. It’s there, that was a hundred percent passed. You can think of that and that was hopeful. I think that the ear marks are here of what’s happening. You can look about and see a change in temperatures. Everybody’s kind of basking in the warm winters and they don’t say so but they like it. But the lack of snow on the ground, the lack of snow on the ground, it’s bad for the Earth. That’s water. Earth is water. When the Earth doesn’t have a blanket of snow that it can melt slowly into the earth and rejuvenate the water and you could have a dry season. Then the influx of winds, high winds we see that. That was told to us. We were told two things they said that will tell you what the condition of the Earth will be when the Earth is deteriorating. One will be the acceleration of the winds and the other will be how people treat their children. It’s a comment on both the natural world and a comment on human population. How people are treating the children today are very bad. At the time when people mention that, people say, Well that can’t be. Who would who would mistreat children? Of course we know better. We know better today. Then the winds we’ve seen and they’re coming and they’re coming stronger. This Katrina was just really the beginning. They’re going to come more and more. This morning watching this string of tornadoes that went through Illinois. It’s just an indication of the violence and the power. We were told long ago that the winds are so strong that if they ever do come down to the Earth itself they can blow the very dirt off the face of the Earth. We don’t want to see that. We’re told that the only way to do that is to be respectful and in your conduct. So there’s a lot of indicators. Indicators of what’s going on today. Population beyond control. Mother Earth has laws and rules and one of them is balance. She will keep the balance regardless. If an element is out of balance, like the population of human beings on this Earth, She will balance it. How She does that we may not like. Most likely it’ll come with disease and this will be very democratic. It will go across people’s lives. It will go across leaders. It will go across everything because really there’s no mercy in Nature. There’s only the law and the rule. I think that’s where we fail and we’re way, way away from that. People have taken religion and confused it with their own ideas of power and authority. From what I know, and I don’t know a lot, I think old age gives you one perspective and that’s the older you get the more you realize how little you know and how much more there is to know. At my age I have a perspective about that and I see that human nature and human beings have a very consistent way of doing things. That’s learning the hard way. They just love to learn the hard way. It seems like every generation has that even though the instructions are clear. I remember even with my own son Rex, a lot of trouble with Rex from the beginning. My daughter was fine. Rex, he had a hard time. I used to call him Rex The Hard Way. It took him a long time but he’s doing well and he had to learn the hard way. I tell you it was hard, hard on everybody. But I think in these times we don’t have a lot of time. We don’t have—I think time is an an element here. The Maya said to us that their calendar is ending on 2012. I said well, Okay. And then what? They said, Our calendar is predicated on a number of years and so this number of years is over and we’ll simply make another. I said, Oh wow that’s good news. I said, But what about, is anything going to happen? They said, There’s going to be a period of enlightenment. I said, A period of enlightenment. And I said what is that? And I wondered about it. What is enlightenment? Enlightenment is when you suddenly perceive something and you see it for what it is and you understand it and it’s clear. I thought this probably could be like this group of men that went out on a fishing boat on Montauk Island. It was such a nice day, they said let’s go swimming. Of course not realizing that Montauk is a runway for the great white shark. They’re out there splashing around and one of the men happens to see a fin of very large proportion bearing down on him. Now that would be a period of enlightenment. He would see everything clearly and hard to say what you would think about at a time like that; I should have stayed home, I should have not gone swimming, I should have, shoulda, woulda, coulda. That’s an old saying isn’t it? That’s where we are. We’re right there. The period of enlightenment and the ability for us to deal with it is going to reflect on, I think, the teaching of the Peacemaker again. Maurice Strong who was the Secretary General of UNCED in 1992 in Rio asked me to repeat for him the instruction from the Peacemaker so that he could pass it on to the leaders of the world. I said, Really. He says I think it’s a good instruction. So it goes, it’s very simple. The Peacemaker said to the assembled Chiefs that he had taken all this time to raise and instruct and give the Clans and the Nations and the responsibilities of the Women, responsibilities of the Men, responsibilities of the People—which is by far the largest responsibility. And he said that when you sit and you council for the welfare of the people think not of yourself nor of your family or even your generation, he said, but make your decisions on behalf of the seventh generation coming so they may enjoy what you have today. It’s an instruction of responsibility. It was a very visionary instruction. It was a long-term instruction. It was one that looked seven generations and I’m talking the full life of a person. Not the generations they have today of twenty years or so. To us that’s not a generation. So he was saying if you take care of the future you’ll be taking care of yourself. You yourself will have peace. Peace is what we want. Peace is what we’re after. The wars that are raging about now are violent, violent, I would say, examples of what happens when you refuse to acknowledge a better way of life. We have to do better if we’re going to survive. I’ll tell you this: that the Earth is not going to disappear. They have a great regenerative power, this Earth. One of my good friends John Mohawk, young man, what I call resident intellect of the Iroquois; great, brilliant mind. He said, I always thought that human beings are still a biological experiment. We’re here a short time. Haven’t been here long. In the time of the Earth, not very long at all and the Earth is not dependent on us, we’re dependent on it. So that if we choose to eradicate ourselves from this Earth by whatever means, the Earth goes nowhere and in time it will regenerate and all the lakes will be pristine, the rivers, the waters, the mountains. Everything will be green again. It’ll be peaceful. There may not be people but the Earth will regenerate. And you know why? Because the Earth has all the time in the world. And we don’t. So I think that’s where we’re at right now. At some time, some time long ago, I think it was when Europe began to domesticate animals, there was a different course in direction in life from what things used to be. Not to say it was wrong. Just simply what happened. And that developed into a whole idea of Europe. And they developed into nations, the idea of nations. They’re relatively new, this idea of nations. Nation states is certainly new. And states that’s almost within our lifetime but not quite. This whole idea of consolidation of power in entities has been a development of humanity to a great degree. Unless of course you’re Indigenous and you were living in the north country where you really had to depend on your knowledge of the environment to survive. The best teachers that we had and we learned from all the time was Nature and the animals. They taught us a lot. Any indigenous person will tell you that. I know one of the leaders from Greenland, Inuit man said, If it wasn’t for the bear we wouldn’t know how to survive. It is that that’s important and what the teachers are and how they do things and how you observe that. These are people who have great observation. We’ve learned that over a period of time. I myself I’m not a spiritual leader. I happen to agree to work for the Confederation and work for the Onondaga Nation. But I’m just simply a runner for Elders and for people who knew a lot. I’m not the best person I don’t think in terms of representation of Indigenous People. However as it turned out in this idea of running and I do that a lot, I go everywhere and speak, and they said well you’ve learned how to speak the English language very well so you go and do it and they instruct me what to say and then I go and do it. But also in that process you have to think on your feet and make some decisions and so forth. Over the period of time and I’m what you call an acclimated man, the Iroquois have been in contact with Western European society for a long time. The first treaty we had was 1613, was called a Two Row Wampum. We laid down some discussion points at that time. We said that, You want to trade in our territory—talking to the Dutch, 1613—but we see that you’re not seeming to go away here. So we think that maybe we better talk about relationship. How are we going to deal with one another? So we set up the Two Row Belt. Which just actually says that this is your ship, your people, your ways of life, your governments; our canoe, our people, our way of life, we go down the River of Life, the Guswenta, side-by-side. And we’ll be hooked together with the chain, three links: Peace, Friendship, [and Forever,] for as long as the Sun rises in the east, as long as the rivers run downhill, and as long as the grass grows green. That’s where those words are. It’s the Grandfather of all treaties between us and our White Brother. You’ll hear that, you’ll hear those words again and again whether you hear it from Oklahoma ... It’s a standard. We talked about respect there and we respected them. We established a process. I think at the time there was a real option on the part of Europeans to change when they came here. But I think that Two Row Belt was a great observation and a great comment on how we saw life. If you saw the belt, and we have it, it’s a white belt that’s about three feet long and has two rows of purple beads from the Quahog shell. And the two rows are equal side-by-side going down. The white representing Peace and the River of Life and one row representing the boat and the other a canoe. Held together by these three links we call the Covenant Chain, friendship. Now that was a time in 1613 when Europe was in flames, so to speak. When there were huge ravages of typhoid and great plagues going on and a lot of starving and worse. I think it was what they brought over here. I think at that time if they listened more to our direction and took it a little bit more realistically it might have been a great opportunity to change direction. But if you remember in the North East it was the Pilgrims that landed. They were coming with the mindset about religion and God and law which we thought was very curious because they did a lot of things we thought were really dumb, really stupid. They didn’t laugh, they didn’t smile, they all wore black. It was just—we were fascinated by this group of people, but underestimated them I’m sure. That idea, that mindset and that Christian doctrine, that Christian idea has really dominated this land. After a while they said, if the blood runs to our ankles we’ll take our land. And they called our land their land. If the blood runs to our ankles. It showed that they were bringing this idea. In the whole history of what occurred with the Spanish Conquistadors, the Inquisition, all going on, 1492, the Pope’s declaration that we’re flora and fauna, that we have no right of title to this land, established into US federal law. Obviously they had a chance. The second big chance was when they formed the United States and we were working with them in that direction. The Continental Congress came to us and said, Will you fight with us against the King of England? Our Chief said to him, That’s your father. We know your father. Worked with your father. We love your father. We know you. We’ve worked with you. We love you as well. So we see this as a fight between father and son. We think it wouldn’t be proper to join in this family fight. The Continental Congress representatives, and they were meeting in upstate New York, they said, Well good, they said, Because that was our second request. If you were not going to fight with us you wouldn’t fight against us. And we said that’s what we agree, we think. Six Nations at that time was merely trying to survive these huge elements of power from France and from England and from Spain whipsawing right across what is now New York. We’re right in the middle of this thing and using the best of our ability to survive. So we took that position. George Morgan, who was the one speaking, said, That’s good. We agree with that. He went back to the Continental Congress and John Hancock, the first President of the Continental Congress, commissioned a wampum belt to be made and to verify this, sanctioned us and sanctified it and this belt was made. He commissioned and they made it. They were dealing in our style of government, wampum. The meeting was held at Fort Pitt in 1776 and that was the first peace meeting between the new United States and the Six Nations. Even at that time Six Nations asked them, Where’s your flag? They realized they really didn’t have a flag. The first flags that they flew, if you remember, was a pine tree. It was a pine tree with the eagle on top. So they took a lot from us. They took a whole lot. Government by consent, bicameral, two houses, elder brothers, younger brothers, council fires, the great fires, they called themselves the thirteen fires as we called ourselves the six fires. Oh we were really, really involved. Our Chiefs were up and down the whole East Coast almost every event, died on the road, trying hard to survive and keep the peace. I think at that time the opportunity was there. Then when they they made the Constitution, another great opportunity, but they wouldn’t give up slavery, they would not give up slavery, and the women were nowhere to be seen. We said, How can you ignore 50 percent of the population? Not only that, but with so much dependent upon them. That wasn’t their style. There was a kind of a reverting back to European thinking. Then that was a failed point there in history. Then they began to consolidate and it worked up to the point when they called it the manifest destiny about 1843, I think the first time it was mentioned. Manifest destiny, God has destined us to be the leaders. It’s that kind of thinking that has been driving this country. These wars that we’re engrossed in right now are nothing but an extension of that kind of thinking Very, very ill-timed and ill-conceived and has created such turmoil across the world. We have to have peace. We have to have a better understanding of who we are and there has to be a great sharing. How can you expect a country who would elect the President, Bush—although people will say that he didn’t get elected, but you’re talking about the highest court in the world challenged for their integrity. And now Indian Nations, trying to maintain themselves. A study made some time ago found out that the Lakotas in Pine Ridge were the poorest people in the United States. Yet they should have one half of all home state coal mining. That should go to them according to the Fort Laramie Treaty of 1868. Treaty of 1868. That was the agreement. These treaties that we have today, that we still have, we try to activate them. It’s impossible. It’s ignored. But it’s real. I think America has to change course and quickly. They have to instruct the children in a better way. They have to be aware that there are forces larger than human forces. These forces are absolute with no mercy and if you don’t learn you’re just going to suffer the consequence. The instruction has to come from the leadership and from the people. There are so many good people in this world and that gives me hope all the time. As I said before I represent a Council, I represent a Nation, I represent a Confederation and I represent, often, Indian thinking across America. We have a traditional circle of Indian Elders and youth. We meet annually and we have this discussion. We talk about the condition of the Earth and how it is and what’s in store. There is hope, always hope. The hope is in the conduct of people. But the actions and time are forcing issues now. The fact that I’m sitting here talking to you and that I reflect a lot of the learning that I’ve learned from people like Gorbachev and Turner and my good friend Dean Morton. Many, many good people in this world and many directed to the right way and the fact that you yourself are taking this mission which is what it is and that you have leadership, this young lad by the name of DiCaprio, I’m encouraged, that take the serious issue. Because that’s what it’s going to take and you’re going have to bring awareness to the people. I hope that this will help and help them understand that it’s really almost not a question of who’s right and who’s wrong. It’s a question of what do we do now? That’s the direction. What do we do now? And we organize our forces and we organize our leadership and we direct ourselves in a big unified effort around the world to act on behalf of the seventh generation and all the life on this Earth. Peacemaker said to us in the instructions, he said, Now I place in your hands the welfare of all life. He didn’t said welfare of the people. He said the welfare of all life. Now we take that literally. When I travel and when I speak I’m just doing my instructions that was given so long ago. Because our mandate is to look out for everybody and I can tell you that when we have our ceremonies, and we’re going to have a planting ceremony pretty soon, and we’re going to have a ceremony for the strawberries and Leader of the fruit, and we’ll have a ceremony for the beans, and we’ll have a corn ceremony. When we have these ceremonies you’re all included. We don’t say this is a ceremony for the Onondagas. We say this is a ceremony for the people and we were told that as long as we hold these ceremonies we’re going to survive. As long as there’s one to listen, one to speak, one to sing, one to dance, we’ll fight on. So it’s up to us. It comes down to us at the last minute. We have to use our common sense which is not so common anymore. I think we have to rely on our own observations and challenge poor leadership, change leadership, and act quickly and strongly and be convinced of our direction. It certainly would reinforce the Indigenous People, traditional people, it would make us feel good to see this. I can report to my people, There’s a group of people out there that are doing something and we’ll see where it goes. At least they’re allies. So that’s what we are, we’re allies. It’s a common fight, common cause. It’s for the future. It’s for peace. What could be better? It’s a good fight. We should be happy to be in it and happy to be able to make that difference. I believe it’s this generation and next one coming going to determine whether we survive. The Peacemaker & the Tadadaho (2015, 10:01). Created by the Haudenosaunee; Films and Website by Tree Media; Executive Producers: George DiCaprio, Leonardo DiCaprio, Oren Lyons, Oliver Stanton, Gayle Kelly, Roee Sharon Peled; Producers: Leila Conners, Mathew Schmid; Directed by: Leila Conners. The Peacemaker’s Journey & The Great Law of Peace (published 2016, 4:11) from Skä•noñh – Great Law of Peace Center, A Haudenosaunee Heritage Center. The Thanksgiving Address is such a beautiful oration. I think of it as just this river of words that takes us to an orientation of gratitude. It reminds us to acknowledge that we’re not alone in the world. That our very lives are dependent upon the gifts of all of these other beings with whom we share the planet. [↩] The Earth Summit in Rio de Janeiro, 3-14 June 1992, was unprecedented for a UN conference, in terms of both its size and the scope of its concerns, UN Conference on Environment and Development. [↩] Official document: “S.Con.Res.76 - A concurrent resolution to acknowledge the contribution of the Iroquois Confederacy of Nations to the Development of the United States Constitution and to reaffirm the continuing government-to-government relationship between Indian tribes and the United States established in the Constitution”. [↩] For a sample of his lucid intelligence, see “The Warriors Who Turned to Peace,” John Mohawk, Yes Magazine, November 11, 2004, and Survive and Thrive (2004, 21:35). The Haudenosaunee and the Dutch agreed on three principles to make this treaty last. 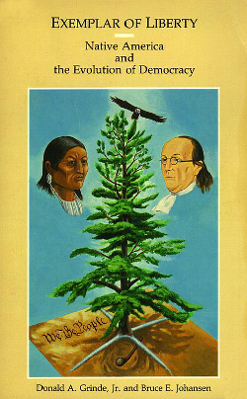 The first was friendship; the Haudenosaunee and their white brothers will live in friendship. The second principle is peace; there will be peace between their two people. The final principle is forever; that this agreement will last forever. See Also: An Analysis Of The 1613 Tawagonshi Treaty, Onondaga Nation. [↩] Two Row Translation and Context of 1613 Treaty by Robert Venables (retired professor of Native American Studies at Cornell). Jon Parmenter, The Meaning of Kaswentha and the Two Row Wampum Belt in Haudenosaunee (Iroquois) History: Can Indigenous Oral Tradition be Reconciled with the Documentary Record? Journal of Early American History 3 (2013) 82-109. Howard McClellan, “INDIAN MAGNA CARTA WRIT IN WAMPUM BELTS, Six Nations Show Treaty Granting Them Independent Sovereignty as Long as Sun Shines,” New York Times, June 7, 1925. Source of the above and more detail at: Two Row History, Two Row Wampum Renewal Campaign (1613-2013). According to this Medieval Canon Law, European Christian monarchies acquired title to the lands they discovered and Indigenous inhabitants lost their natural right to that land after Christian Europeans had arrived and claimed it. Under this legalistic cover for theft, European and Euro-American wars of conquest and settler colonialism in the Western hemisphere devastated Indigenous nations and communities, ripping their territories away from them, and transforming the land into private property, or real estate, along with another form of private property, enslaved African bodies. In the United States most of that land ended up in the hands of land speculators who were also slavers and agribusiness operators called plantations, such as most of the US founding fathers, so-called, and most of the US Presidents and other government and military officials up to the Civil War. Arcane as it may seem, the Doctrine of Discovery remains the basis for US federal laws still in effect that control Indigenous peoples lives and destinies, maintaining a regimen of suffocating settler colonialism under the color of law. From the mid-fifteenth century to the mid-twentieth century, most of the non-European world was colonized under the Doctrine of Discovery. This is the first principle of international law that Christian European monarchies promulgated to legitimize the investigating, mapping, and claiming lands belonging to non-Christian peoples outside of Europe. It originated in a Papal Bull, issued in 1455, that permitted the Portuguese monarchy to seize West Africa for slave raiding. Following Columbus’s infamous exploratory voyage in 1492, sponsored by the king and queen of the infant Spanish state, another Papal Bull extended similar permission to Spain. Disputes between the Portuguese and Spanish monarchies led to the Papal initiated Treaty of Tordesillas in 1494 which, besides dividing the globe equally between the two Iberian empires, clarified that only non-Christian lands fell under the Discovery Doctrine. This Doctrine, on which all European states relied, originated with the arbitrary and unilateral establishment of the Iberian monarchies’ exclusive rights under Christian canon law to colonize foreign peoples, and this right was later seized, and absorbed, usually explicitly, if not by common law, by Protestant, Christian, European monarchical colonizing projects as well. But not only monarchies. Following the revolution that overthrew the monarchy, the French Republic applied the Doctrine of Discovery to legalize its nineteenth- and twentieth-century settler colonialist projects in North Africa, Southeast Asia, and the South Pacific. As did the anti-monarchy, independent United States when it continued the settler colonial project of North America, begun, but then halted by the British monarchy, in 1754. Indeed the populist settler colonialism of those republics, as well as the late Spanish settler colonies—Argentina, Uruguay, Paraguay, and Chile—when they won independence and became republics, proved to be the most insidious, including genocidal policies, which in terms of the 1948 Genocide Convention, includes forcibly removing children from the group, forcibly preventing births within the group, creating conditions of life that make the group’s continued existence impossible, destroying the groups means of subsistence, forced removals or ethnic cleansing, and other acts such as killing, that constitute genocide in international law. Indicating the intentions of the newly independent United States, in 1792, Secretary of State Thomas Jefferson asserted that the Doctrine of Discovery, developed by European States, was international law, applicable to the new US government as well. Codifying the Doctrine of Discovery as domestic law in 1823, the US Supreme Court issued a decision, actually a collection of decisions, three decisions, concerning the Cherokee Nation in Georgia. Writing for the majority, Chief Justice John Marshall held that the Doctrine of Discovery had been an established principle of European Law and an English Law in effect in British North American colonies, and was also the law of the United States. See Also: from the Digital Wampum Series: The Doctrine of Discovery (2015, 5:59). Created by the Haudenosaunee; Films and Website by Tree Media; Executive Producers: George DiCaprio, Leonardo DiCaprio, Oren Lyons, Oliver Stanton, Gayle Kelly, Roee Sharon Peled; Producers: Leila Conners, Mathew Schmid; Directed by: Leila Conners. The newly found journal points up the significance of the Hancock letter, which clearly signaled the inevitable break with England. Before the Americans could declare their freedom, they wanted a treaty with the Iroquois, Delaware, Shawnee and other tribes guaranteeing the Indians’ neutrality in the Revolutionary War. The 73 pages contain a vivid account of Morgan’s prodigious efforts to carry out this policy. ‘Twice the British met with tribes to recruit the Indians for a mass attack that would have doomed the colonies,’ says Schaaf. ‘Morgan had spies at both meetings—and at one his agent was the translator.’ Morgan succeeded among the Indians because of his enormous personal prestige and their fear for the safety of their women and children. This temporary exhibit at the Skä•noñh Great Law of Peace Center explores women’s issues both past and present. Part of the exhibit deals with a comparison of Euro-American and Haudenosaunee women before the women’s rights movement and the other part focuses on a project by multidisciplinary artist Jaime Black to raise awareness about the alarmingly high number of missing or murdered Aboriginal women in Canada. 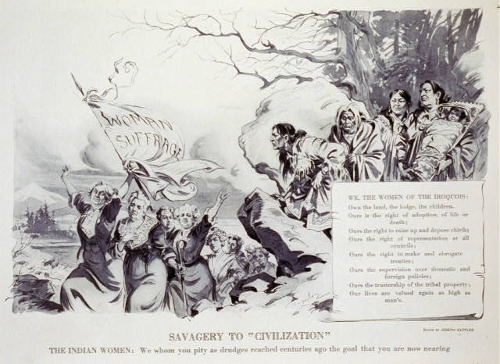 The exhibit highlights traditional differences between Euro-American and Haudenosaunee women on Social, Economic, Spiritual, and Political levels prior to the women’s rights movement. Women have always had positions of leadership in the matrilineal Haudenosaunee society. They had control over their own property, bodies, and children in an egalitarian culture. The exhibit contrasts differences with respect to Family, Clothing, Legal Rights, and Political Voice. It explores the influence that the Haudenosaunee had on the American women’s rights movement in the words of early leading activists like Elizabeth Cady Stanton, Lucretia Mott, and Matilda Joslyn Gage. 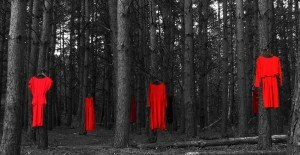 Jaime Black’s project used red dresses to symbolize the missing Aboriginal women and originally involved an event and march where the dresses were hung from trees and draped across landscapes. Her aim was to draw attention to the fact that Indigenous women are almost three times as likely to be killed by a stranger than non-Indigenous women. This exhibit pays tribute to Black’s REDress Project to support her attempt to raise awareness about the ‘gendered and racialized nature’ of these violent crimes and the fact that over half of them remain unsolved. The exhibit will be on display beginning Thursday, March 8th, 2018. Own the land, the lodge, the children. The Great Sioux Nation was my first book in 1977. It came out of the Wounded Knee trials. All of the people who came out of Wounded Knee were arrested and charged with various felonies and misdemeanors so it just tied the movement up. Each one, one after another, were dismissed or the people found Not Guilty. A few people served some jail time. It was kind of purposely putting the American Indian Movement (AIM) through great expense, raising money for court cases and not being able to organize in the communities. So we decided to have these remaining cases, I think there were about 90 of them left, that they all be dismissed on the basis of this [1868 Fort Laramie] Treaty that said that any crimes committed in the Great Sioux Nation, the people were subject to punishment by Sioux authorities. This  was when the Great Sioux Nation was a contiguous land base that covered all of North and South Dakota, some of Wyoming and Montana and much of Nebraska that has been broken down into 7 separate little reservations within that. The largest amount of that land, taken away when the Black Hills were the sacred area of the Sioux, were taken illegally. Thanks to the Reclaiming Native Truth project, there is data to show that most Americans know little to nothing about treaties between Native Nations and the United States, even though they are U.S. citizens’ treaties, too. Even more troubling, most do not know that or how the sovereignty of Native Nations and European Nations legitimized the sovereignty of the United States. Reclaiming Native Truth’s research and findings establish that this profound and widespread ignorance has far-reaching negative consequences in all areas of governance, economic development and health and well-being of our Native Peoples. [↩] Concerning the issue of Land Rights Actions, the following is a recent set of accounts concerning the ancestral lands of the Onondaga People that were stolen by government actions of the United States. Onondaga Nation Files Appeal to 2010 Dismissal of Land Rights Action, Press Conference held at National Press Club, Washington DC, 28 Feb 2012. Washington, DC – On April 15, 2014, the Onondaga Nation filed a Petition against the United States with the Inter-American Commission on Human Rights (IACHR), part of the Organization of American States (OAS). A goal of OAS is to achieve an order of peace and justice within the Americas, which the Onondaga Nation is seeking with this petition. Onondaga Nation leaders announced their Petition against the United States by holding a press conference in front of the White House. The Onondaga Nation filed a land rights action in the United States District Court on March 11, 2005, which the federal court dismissed. The Nation then appealed to the Second Circuit Court of Appeals, which affirmed that dismissal. Finally, the Nation filed a petition for a writ of certiorari with the Supreme Court seeking review of the dismissal and its affirmance. The response from the U.S. courts bars the Nation from any domestic remedy for these treaty violations, and refuses the Nation any chance to articulate the violations of New York State dating back to the late 18th Century. The ultimate purpose of the Onondaga Nation in the assertion of its land rights is to enable the Nation to maintain its culture and way of life, and to protect the earth and its environment for all inhabitants of central New York. The Nation’s Land Rights Action has not been disruptive. In its petition to the Inter-American Commission on Human Rights, the Onondaga Nation demonstrates that the denial of any remedy for the taking of their land and the treaty violations are a human rights violation under the United Nations Declaration on the Rights of Indigenous Peoples, the American Declaration of the Rights and Duties of Man, and other international agreements. Read the petition and information regarding the Onondaga’s Land Rights Case.